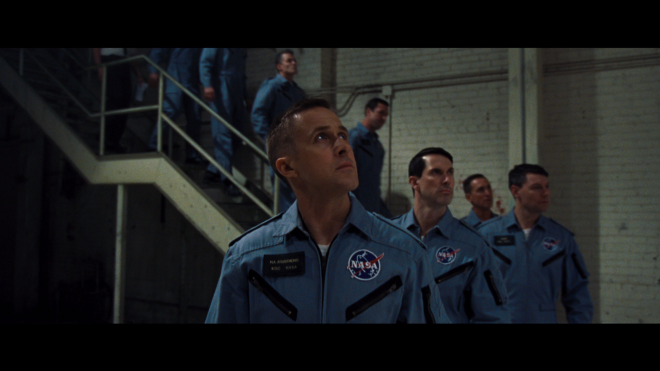 Director Damien Chazelle's First Man is a wonderfully satisfying adaptation about legendary astronaut Neil Armstrong, featuring terrific performances by Ryan Gosling and Claire Foy. The Ultra HD safely launches to 4K home theaters with an excellent Dolby Vision HDR presentation, a fantastic Dolby Atmos soundtrack, and the same set of supplements you will find on the Blu-ray. The overall package makes Recommended addition to the UHD library. When reading about the controversy surrounding First Man, I'm reminded we're living in an era where contemporary moviegoers now and again can't see the forest for the trees. Too many feel personally slighted, unreasonably disappointed and biasedly preoccupied on the irrelevant details affecting a film's overall plot, which seems to be a growing concern in the last few years in this age of social media. Complaining about the missing American flag during the Apollo 11 moon landing, which is the current squabble, overlooks the number of times the movie blatantly features the flag in many other areas and never lets audiences forget the historic voyage was very much an American endeavor. This wonderfully satisfying telling of the Space Race and the significant achievements made is immersed in an atmosphere of patriotic duty, thematically centered around the emotional-psychological sacrifices of the brave astronauts, as experienced from the perspective of Neil Armstrong. Ryan Gosling stars are the celebrated space traveler and the first person to step onto the lunar surface in 1969, marking a significant moment in the history of humanity. Amid all the strife and turmoil occurring around the rest of the world — which, by the way, unfolds in the background much like the flag, but where is the uproar for that? — the historic voyage is a shared accomplishment by all the people of Earth. And the poignant, deeply-touching beauty of Josh Singer's (Spotlight, The Post) script, based on James R. Hansen's novel of the same name, is it reminding audiences of a time when the world and the U.S. seemed on the brink of chaos, yet the importance of walking on the closest rock orbiting our planet is an achievement that remarkably quieted tensions, if even only for a moment. 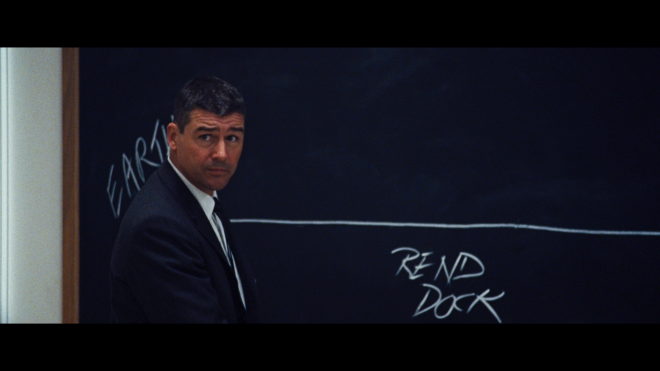 Intentional or not, director Damien Chazelle (Whiplash, La La Land) seems to make very subtle parallels between the disorder of the world and that of Armstrong's personal struggles. Gosling's controlled, deliberately detached performance has little concern with portraying the astronaut as an American legend, bent on satisfying or further exalting our collective mythologizing of a real person. Under Chazelle's direction, it has more to do with simply depicting a father straining to find balance after the death of his daughter — or better yet, a man grappling with loss all around him but unsure of how to confront or cope with the emotional pain. He is, at once, seemingly motivated to not allow those deaths to be in vain, but he also displays moments of a tireless obsession to complete the mission, almost to the point of being neglectful to his family while his wife Janet (a wonderfully memorable Claire Foy) watches apprehensively of how to help her husband. One of the more heart-rending moments is with Armstrong and Ed White (Jason Clarke) walking at night, and the sight of child's tree swing suddenly pauses the conversation because Armstrong recalls a similar swing he built for his daughter but awkwardly walks away than talk about it with his friend. 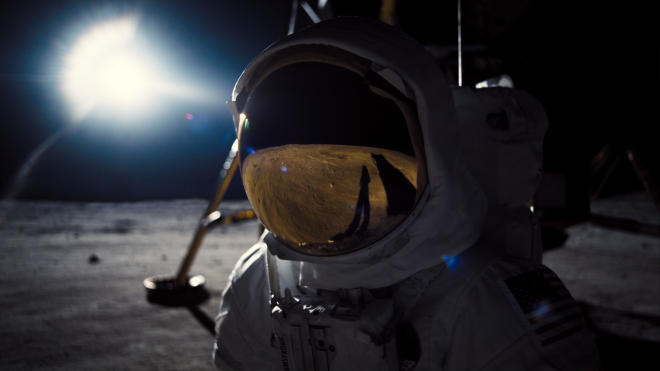 It's these sorts of moments that make First Man a wondrous and stirring film that splendidly humanizes a legendary figure of history, and on that front, the production should be commended, from the performances and plot to the stage design and the visual effects. However, Chazelle's inventive approach to the material doesn't always gel well or always perfectly capture the emotional impact certain scenes seem to imply. Reuniting with Linus Sandgren, the heavily-stylized cinematography tells the story with the sort of shaky-cam documentary realism that feels rather amateurish, constantly pushing in on faces and frankly pointless close-ups that add little to the narrative. Meanwhile, other aspects feel rather self-indulgent, as though knowing its importance and making the effort to appear as visually creative as possible, even if the scene doesn't require it. Frankly, there are times when the camerawork seems to evoke the spirit of a Terrence Malick film or Stanley Kubrick's 2001. Nevertheless, for his fourth feature film, Chazelle remains a strong storyteller, even if his sudden artistic flurries get the better of him, and First Man is still an excellent film. 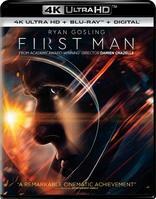 Universal Studios Home Entertainment brings First Man to 4K Ultra HD Blu-ray as a two-disc combo pack with a Digital Copy code. When redeeming said code via Universal's website or Movies Anywhere, users have access to the 4K Dolby Vision version with Dolby Atmos audio. The triple-layered UHD100 disc sits comfortably opposite a Region Free, BD50 disc inside a black, eco-elite case with a lightly-embossed slipcover. At startup, the disc goes straight to a static screen with the usual options along the left side and music. The bio-drama safely lands on the dark side of Ultra HD with a splendidly and highly satisfying HEVC H.265 encode that impressively and surprisingly offers a better viewing experience than the Blu-ray. However, similar to what we see on the HD version, the filmmakers' visionary style poses a few challenges when making a proper assessment, namely the amount of soft, blurry scenes, which are the result of creative choice and film stock. The drama was shot on a combination of 16mm, 35mm and 65mm film, and those elements were later mastered to a 2K digital intermediate. The video continuously fluctuates from razor-sharp definition with a very fine layer of grain to glaringly soft awash in a prominent coating of grain. Nevertheless, the 2160p transfer enjoys a notable uptick overall, showing significantly better clarity of the background information, exposing every nook and cranny of the space capsule's interior, the inside of mission command and the lettering on each button is intelligible from a short distance. The final third act with the Apollo 11 launch and lunar landing provide some of the best moments, revealing the smallest stitching and threading along the spacesuits, and the tiniest pebble and rock on the moon's surface is plainly visible. In the end, the picture delivers an appreciable, very film-like step-up over the Blu-ray. The 4K video also makes the historic voyage with a noticeably perkier and more dynamic contrast while remaining faithful to the creative intentions of the filmmakers. Although comparatively brighter overall, the more somber conversations still show some restraint, but the sequences with space travel receive a notable boost, displaying crisp, radiant whites in Earth's skies, the sterilized spacesuits and the space capsules. In other places, specular highlights mark an appreciable improvement as well, providing a tighter, narrower glow within the brightest spots while also exposing a few more details and giving metallic edges a realistic glimmer. On the other hand, in the aforementioned softer scenes, highlights tend to run on the hotter side, creating a tad of blooming and engulfing the finer aspects. Like the Blu-ray, brightness levels are more consistent, showering the 2.39:1 image with slightly richer, inkier blacks and darker, pitch-black shadows but with better detailing. Again, the sequences in space provide a few demo-worthy segments and a lovely cinematic appeal. The biggest and most significant improvement is undoubtedly the color palette. Whereas its HD SDR counterpart felt a bit more subdued and somewhat low-key, this Dolby Vision presentation launches Linus Sandgren's heavily-stylized cinematography to the cosmos. Immediately, primaries are considerably more vigorous and absolutely sumptuous, from the lively greens of the well-manicured lawns of the astronauts to the richly vivid reds of clothes, surrounding furniture or the emergency lights that suddenly heighten the suspense. However, because of the orange-teal photography, greater emphasis is placed on the variety of blues, showing appreciably nuanced differences between the teals, cyans, ceruleans, and the deeper navy, indigo and admiral shades. 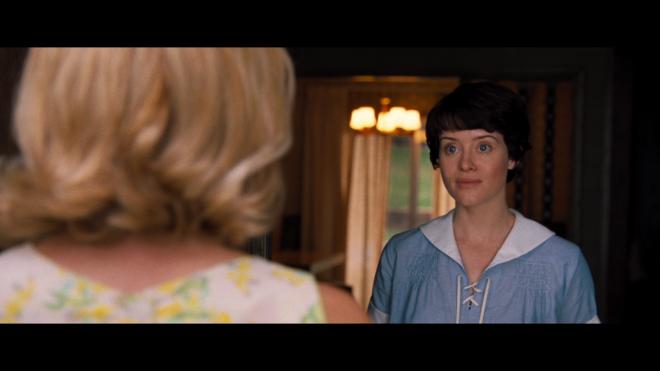 Many sequences set inside the Armstrong household are bathed in warmer, true-to-life yellows, ambers and browns, keeping with the film's rough, vintage documentary feel. Scenes on the moon are perhaps the most dramatic, looking a deeper, more accurate shade of grey. Being a historical period drama, it's reasonable to keep expectations in check when it comes to the audio portion, but the accompanying Dolby Atmos soundtrack actually surprises with the amount of activity present throughout the movie's 141-minute runtime. Granted, the emphasis and focus are definitely on the characters and their interactions, delivering precise, very well-prioritized dialogue even during the loudest, more intense moments. Imaging continuously feels broad and spacious, exhibiting a dynamically extensive and detailed mid-range that provides excellent clarity in action sequences but deliberately distorted when rockets are being tested or blasting off. Background commotion moves smoothly between the three front channels and subtly into the top heights, generating a highly-engaging half-dome soundstage. Arguably, the low-end could perhaps hit harder and dig deeper in the launch scenes, but that's more a matter of personal taste and expectation, as bass is nonetheless quite commanding and occasionally couch-shaking. All the same supplements are shared between the Ultra HD and the accompanying Blu-ray. Audio Commentary: Director Damien Chazelle sits down with screenwriter Josh Singer and editor Tim Cross for an amusingly informative conversation on the technical details behind the production and the amount of work that went into a few key sequences. Putting You in the Seat (HD, 7 min): A fascinating and enlightening look at the innovative technology used for the production's creative visual style. Recreating the Moon Landing (HD, 6 min): Exactly as the title implies, the featurette is a behind-the-scenes look at recreating the historic moment and doing it justice. Giant Leap in one small Step (HD, 5 min): A much-too brief piece on Neil Armstrong and the production's emphasis on his personal life. Shooting for the Moon (HD, 4 min): Chazelle talks about his involvement in the production, adapting the historic event for the silver screen and working with Ryan Gosling. Preparing to Launch (HD, 4 min): Cast & crew interviews discussing their part in bringing the little-known story about Armstrong and the Apollo 11 launch for mainstream audiences. 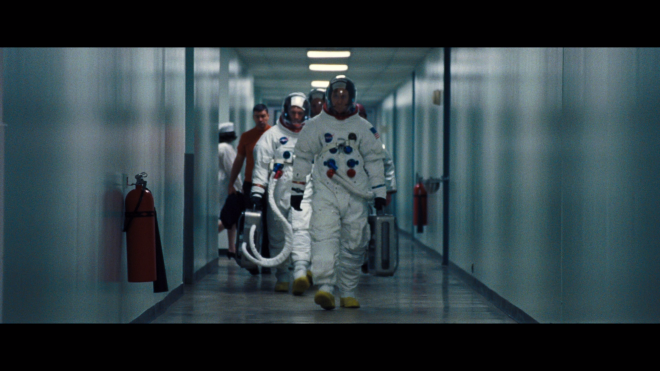 Astronaut Training (HD, 4 min): Cast attends astronaut bootcamp prior to filming. Mission Gone Wrong (HD, 3 min): A quick look at some of the stunt work. Shooting at NASA (HD, 3 min): Interviews chatting about the joy of using real-life locations. Although director Damien Chazelle's approach to the material is to a certain degree questionable and at times distracting, First Man is nonetheless a wonderfully satisfying telling of the Space Race and the Apollo 11 lunar landing as told from the perspective of Neil Armstrong while featuring terrific performances by Ryan Gosling and Claire Foy. The Ultra HD safely launches to 4K home theaters with an excellent Dolby Vision HDR presentation that surpasses its Blu-ray counterpart and the same fantastic Dolby Atmos soundtrack. Although supplements are rather short and somewhat disappointing, the overall UHD package is nonetheless recommended for fans and history buffs.